Once upon a time, Americans had the idea that stock markets traveled on an escalator that went only one direction: up. Once upon a time, Americans also assumed that the rise of democracy and freedom was the worlds unstoppable destiny. The best thing you could say for the state of human rights in 2008 is that they didnt sink as far as the world economy. When Beijing was awarded this years Summer Olympics, some of us imagined that the quadrennial pageant would induce China to liberalize. You might as well hope that Michael Phelps would give up swimming to become a shot putter. Among the governments actions leading up to the games, charged Human Rights Watch, were "massive forced evictions, a surge in the arrest, detention and harassment of critics, repeated violations of media freedom and increased political repression." China won the battle for gold, capturing 51 first-place medals. It earned a less cherished honor when human rights activist Hu Jia, sentenced in April to 3 1/2 years for "incitment to subvert state power," was awarded the Sakharov Prize for Freedom of Thought by the European Parliament. The Soviet Union, which made Andrei Sakharov famous as a political dissident, is no more, but Vladimir Putin keeps it alive in spirit. As required by the constitution, he stepped down as president at the end of his second term, but without ceding a sliver of power. Putin not only installed a protege as president, but became prime minister, an office that suddenly exhibited a power and importance that had gone unnoticed. The former Soviet republic of Georgia had a presidential election of its own -- "the first election where no one was 100 percent sure whether they were going to win or not," as one Georgian analyst marveled. The winner, Mikheil Saakashvili, should have had no such uncertainty about the outcome of the August war with Russia that he rashly helped to provoke. Pakistans president, Gen. Pervez Musharraf, also had no cause for surprise when his party was trounced in elections held less than two months after the assassination of opposition leader Benazir Bhutto. Facing impeachment, the longtime military ruler resigned in August. In Afghanistan, a student convicted of blasphemy had his death sentence overturned, only to get 20 years in prison for circulating an article about the treatment of women under Islam. Mike McConnell, U.S. director of national intelligence, said Afghan President Hamid Karzais government controls less than a third of its territory. Thai protesters shut down the Bangkok airport for a week, leaving only when a court outlawed the ruling party and banned the current prime minister from politics. Shortly after, the opposition Democrat Party won parliamentary elections. A German think tank reported that military coups are going out of style: The number of attempts now averages about five a year, down from double digits in the 1980s. Army officers in the West African nation of Guinea dared to be unfashionable, seizing the government upon the death of President Lansana Conte, who had come to power in 1984 via ... oh, you can guess. In Zimbabwe, perennial strongman Robert Mugabe had to accept what he called the "humiliation" of agreeing to share power after losing at the polls amid famine and hyperinflation. But he refused to step down, proclaiming, "Zimbabwe is mine." Zimbabweans can only envy Ghana, democratic since 1992, which is preparing for the second consecutive peaceful transfer of power from one elected president to another. The ailing Fidel Castro, 82, resigned as president of Cuba after nearly half a century, but his communist regime showed no inclination to follow him. 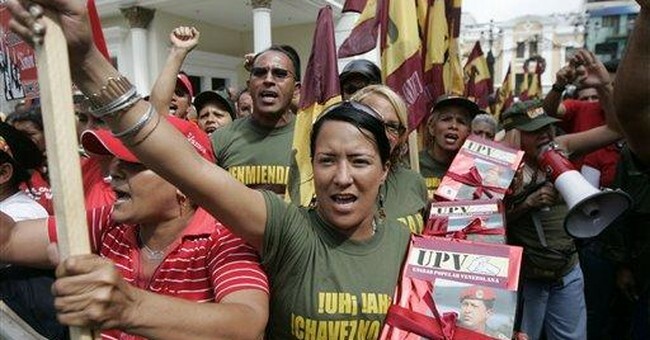 His disciple, Venezuelan President Hugo Chavez, has indicated he would like to stay in office until 2050, when he will be 96. He lost a constitutional referendum last year that would have let him served beyond 2012, but he is not easily discouraged: Already he is pushing for another vote. Chavez is one of many rulers of oil-producing nations who are watching their chief export plunge in value and hoping fervently for a strong rebound. He will gain no consolation from reflecting that human rights are also subject not only to busts but, if memory serves, to booms.